At 6pm I was completely and utterly oblivious to the world. Asleep. I woke up this morning at 4:30 am still tired. Yesterday I was trying to explain the difference between the business world and teaching to a friend and the best way I can explain it is this. Teaching is like living at a conference. You're on the trade show talking to people every day for at least 5 hours - as well as teaching classes about how to do things. But imagine this, during your lunch, the conventioneers often liked to hit, tease, and poke each other, so you have to eat quickly in a place where you can see them. Then, when you do get time to yourself, it is in an office where people come in and out borrowing tape, scissors, and asking questions. Finally, when the convention is over, two or three hours later, you will be alone only to have a random person come in and want to talk for an hour about whatever because they are tired. I often miss the times at Cellular One when I could close my door and get something done. Time poverty is a fact of life in teaching. It is what we live every day and it often takes its toll. You can't pour water out of an empty pitcher. I've been trying to get my feet under me since school started and am not quite there yet. Personally, I try to be careful when I blog and am over tired because it will often come out a tad on the negative side. I love teaching and love my students OR I WOULDN'T DO IT. Having quotas and managing a staff was much easier, as hard as that was. But I get the chance to make a difference in the lives of my precious students. I get to cry with parents and celebrate with kids who've done something cool. They come in my room dressed as squires and monks to show off their attire before heading into AP lit to present for Canterbury tales. I get to laugh (a lot) but also help them stay on track for where they need to go in their lives. These children will scatter through the world like dandelion seeds in just a few years, but I will have been one of the few people who got to see them work together. Teaching is a joy. I just want to tell those of you EXHAUSTED from the beginning of school that things will settle down. The drama will subside. The exhaustion will lessen. Take some time to rest over the long weekend (if you're in the US) and know that you can and will make it. There's a new LIFT app that focuses on habits. I've taken my most important habits and put them in there. You can find friends and give them props when they do certain things. This is a great way to encourage each other. major improvements in your life. The attitude of gratitude works. 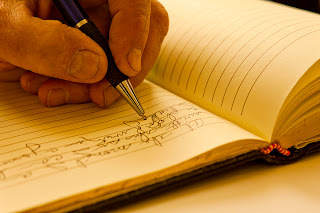 "The gratitude journal was brief — just one sentence for each of the five things — and done only once a week, but after two months there were significant effects. Compared with a control group, the people keeping the gratitude journal were more optimistic and felt happier. They reported fewer physical problems and spent more time working out. Further benefits were observed in a study of polio survivors and other people with neuromuscular problems. The ones who kept a gratitude journal reported feeling happier and more optimistic than those in a control group, and these reports were corroborated by observations from their spouses. These grateful people also fell asleep more quickly at night, slept longer and woke up feeling more refreshed." This is going in my "Lift" today! Kindness makes life sweet. Bitterness repels. 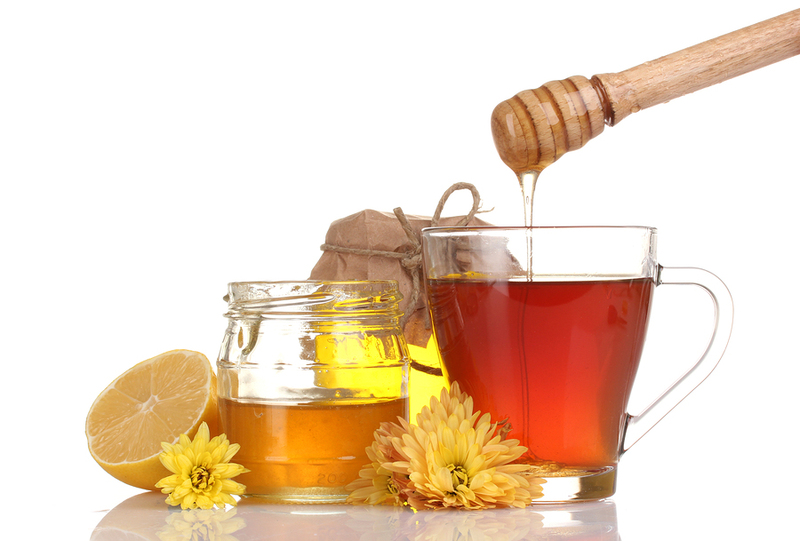 Take time to be kind and you'll attract good things like honey. 3. Make kindness a habit. Try to find people who don't get told "thank you" enough and stop - look them in the eye- and give them a sincere "thank you." Give others credit. Grab a soda and put a sticky note on it while sliding it on the desk of someone who loves that particular drink. Our PTO has asked each teacher to fill out a list of likes and has put the binder in the office and asked parents to come look at the book and be randomly kind to teachers if they want to give encouragement. The fact the book exists at all makes me feel appreciated and loved by our PTO. What if you kept your own kindness binder and had kids put things they like in it? It might seem like a challenge but you could ask them to share with them the free things that you love it when a teacher does that make you feel important. Life is sweeter served with honey. I'm writing this to you from the struggle. I'm not rested and happy in a quiet office all day but shouldering one of the heaviest work loads I've ever had in my 11 years of teaching. I live the struggle daily. My students are worth it. You can get bitter or you can get better. Only two choices. Fill your pitcher with laughter, rest, and time outdoors. I've often found that television is not as rejuvenating as a good book, a nap, or heading out to the farm for a ride through the woods. You are a product of your habits. The things you do every day make you who you are today. You can start a new habit today - every habit has a day 1. Let's put habits in place unique to us as teachers to help replenish the empty pitchers and serve well. WE have a tough job, but we have a noble job. I just want to tell you, teachers, that I am proud to be among you. You are the greatest profession and noble men and women in a society that doesn't appreciate you enough. It is time we appreciate one another and encourage one another and it starts with me. If you feel you have nothing to say, it might just mean more coming from a teacher in the struggle than staying quiet because you don't feel so great. This blog post was written on one such a day. Have a great day, my friends. Be noble. Get rested. And WOW those kids. You're not here just to teacher, you're here to change their lives! Note: All photos used via Big Stock license, you do not have permission to reuse these photos unless you secure your own license. Shmoop has a free Essay lab to help students write. They do have a college essay "tweaker" to help you with that s well. I'm not sure how that works, but certainly for kids who struggle, it might be a good option. UNESCO is in the process of developing a set of policy guidelines for mobile learning aimed at high-level policy makers. To create guidelines that are practical, informative and balanced, they are seeking input from the public. Please consider reviewing and providing input on the guidelines. http://ict.unescobkk.org/forum/viewtopic.php?f=4&t=57603 Public comment will close on 2 September 2012. Drawing on the collective feedback from a range of mobile learning stakeholders, UNESCO will publish a final version of the policy guidelines in early 2013. On September 10th, the non-profit organization EducationSuperHighway will launch a School Speed Test in conjunction with the U.S. Department of Education to take an inventory of the state of Internet access in America's K-12 schools. Their objective is to collect 1 million responses (10 per school) on the ACTUAL performance of the Internet in our classrooms and school libraries. The information gathered will be used to raise awareness of the need to upgrade the Internet access in our schools as a prerequisite to digital learning. It will also help guide the allocation of $2.5 billion in annual funding for school Internet access upgrades. To register for the test, go to www.SchoolSpeedTest.org. Looking at Wevideo, a tool that I'm going to be testing with students that allows students to edit video together. This is great. This infographic is a great one to share with teachers and administrators and shows that 1 in 10 children have seen a family member assaulted in the past year -- even more of them have been assaulted themselves. The infographic shows the warning signs of exposure to violence as well. Share this one with your staff. 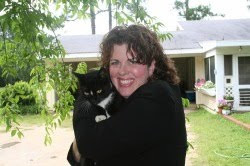 Excellent post from Shelly Terrell about lesson planning and where to find free lesson plans. She's a fantastic sharer and collaborator online. Podomatic has a new free fast tool called "minicast" where you create a slideshow with photos and videos. Create talking photos and slideshows. Aviary has so many great tools including Myna, a collaborative audio editor. A tool that makes it very easy to write on maps. You can put markers, widgets, and put text easily on the map as well as exporting it to Google Earth or Google maps. This is a great tool for children. You shouldn't use paper maps for Geography projects, particularly if you're in a 1:1 program. Try this app instead. A fascinating way that allows you to shoot and upload video that is integrated with Google drive. While there is a free version, there are also paid versions for higher capacity requirements. This allows online video editing and easy sharing with social media. This may be the resource we've been looking for collaborative video editing. Eager to try. A method for facilitating student search using the i-search method. There are 4 phases of using this method and the website says that it is an excellent method for "alternative assessment, inclusion of students with diverse learning abilities, and technology integration." I found the method via a New York Times article on teaching students how to search. A nice lesson plan about helping students learn to find data on the web. Much like wolfram alpha, this explorer on Google lets you explore data from a variety of providers. You can look at search terms from Google and how they vary over time with Google correlate. Some terms have similar patterns. This would make fascinating conversations with your students. You can merge your spreadsheets with data on the web by using Google fusion tables. I'm going to be taking my spreadsheets further and learn how to do this. Information on the Flat Classroom conference in Germany December 6-8, 2012. We have incredible speakers in this Flattened environment where students and educators learn about and envision the future of education on a level PBL-based conferencing style. (We talk about this in Chapter 11 of our book Flattening Classrooms, Engaging Minds.) 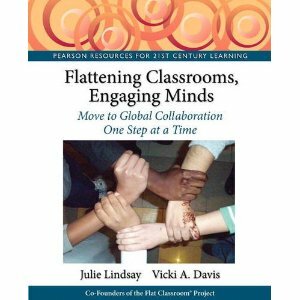 You leave transformed with friendships and ready to flatten your classroom. Once you go flat you never go back! This study by Jerri Lynn Hogg, Ph.D.School of Psychology, Fielding Graduate University, Santa Barbara, CA, USA reviews how Wikipedia IS being used in the classroom. I love this quote by Edward Erikson, "“Wikipedia is always present in the classroom—whether it’s invited to attend or not.” The conclusion, "It is time to embrace Wikipedia as an important information provider and one of the innovative learning tools in the educators' toolbox"As for me, in my classroom, I encourage students to use wikipedia with wisdom - looking at dead text and going to the original sources cited in wikipedia as those they should cite instead of the Wikipedia article itself. Many articles have quite an excellent collection of backup articles behind them that you can see at the bottom of the page. I love these simple (although older) projects that you can use to integrate Google Earth into your classrooms. Most of them involve presentations, but I love what they are doing. An excellent story about how Sheryl Nussbaum-Beach's daughter, Amber, became part of a viral story. This is an excellent example of how social media influence can allow students to become activists. Mapping Media to the Curriculum » What do you want to CREATE today? Wes Fryer has created an excellent resource mapping media to the curriculum that starts off with what you want to create today. This is a fantastic resource to share. Joyce Valenza, teacher librarian extraordinaire, shares about the #tlchat (teacher librarian chat) and how teacher librarians can join in and learn on Twitter. Joyce is a wealth of information, so if you're a teacher librarian, you should join in. A new website about teaching and how to become a teacher. 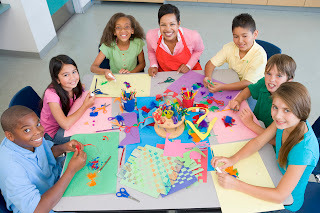 Excellent post on 50 ways to leave paper in the classroom from Joyce Valenza. This set of lessons includes some very popular lessons using fairy tales. All of them are aligned with the Common Core and you can download and share them. The Share My lesson site is giving away a free ipad to the "best sharer" each week. This is a great thing to do as we share with others and help with common core alignment, so join in. This type of article is continuing to proliferate as people question a textbook non-reality based degree happening in many universities. One of the things that made Georgia Tech unique when I was there was how many real-world experiences and projects students were required to do - often for real companies. With the skyrocketing cost of higher education, and the proliferation of "degrees" the brand of a university needs to be tied not to just head knowledge but knowledge of the "hands" (how to). Read this article about hiring web designers, while this is a unique field, it speaks to what is being said in industry about the college education and why college education is destined to change in a fundamental way in the near future. This news shows why freemium may be going away for some businesses. Unless a service can reach millions of users, freemium may not be the best way to go - this article recommends. I think that we will continue to see smaller services consider charging for things. Remember that just because it is free today doesn't mean it will be free tomorrow, i.e. Ning. This superintendent is using Twitter as his PR tool as he tweets out a photo of new teachers at his school. You might want to look at how this is structured if you want to use this valuable, quick tool for sharing the news from your district. Here are some ideas of what Mark is doing for sharing work, I have my students create the blog that suits their personal interest project. While Tumblr is nice for blogging, I have older students and monitor it closely - most schools would not find a good fit in tumblr, I think. Good ideas here, though. This breaks my heart, "A new report finds that 63% of Maryland teachers surveyed say children are not getting enough to eat at home and this is having a negative effect on students’ academic performance. " If we are paying people money so they can feed their family and AREN'T then we should pay again to feed them at school? How can you hold parents accountable for feeding their children? This speaks to the very core of many of our problems in the US - misplaced priorities. Homes have xboxes but no food? Nice shoes and empty tummies? This is upsetting on so many levels. Of course, these statements don't fit all people as they are generalities, however, making sure children are fed is an imperative. It makes me nervous, however, that the government is having to step in and feed children who aren't being fed at home because if they aren't being fed, there are much bigger problems than just a lack of food. As a person who had a time when we were completely broken by a farm gone underwater - I know what it is like to find quarters to buy milk - so this is heartbreaking. People need jobs and kids need food. It is also unfair to penalize teachers whose kids aren't learning if the kids are hungry. What do we do? Evernote and Moleskin announce the new smartnotebook which is very cool. While you can already snap pictures of notes to Evernote - this notebook has small dots that adjust the page to make it square and remove distortion. It includes stickers that will tag the pages for you and add emphasis and included in the price of the notebook ($30) is a free subscription to Evernote premium for 3 months. I love evernote and while their tech support leaves a lot to be desired (it took me 6 months to figure out how to fix an installation glitch which was answered by another user on their forum after Evernote kept telling me just to use Revo uninstaller) -- it can't be beat for usefulness - that is why it is one of the few apps I am willing to pay for. I'll definitely be asking for this notebook for Christmas to try it out. Hope the price comes down a tad, though. Amazon will announce its new lineup of ereaders on Sept 6 and Apple will announce them one week later according to "The Digital Reader" a blog about eReaders and Tablets. The "textbook wars" have only just begun. An excellent article by Alfred Thompson on the white male skew of the AP exams and the issues for Computer Science education. Alfred Thompson, a blogger employed by Microsoft, is my go-to person for Computer Science education topics. This is another example of how he questions the status quo and offers solutions. I highly recommend subscribing to his blog. Meanwhile, my school is moving away from AP altogether into the ACCELL program where our juniors and seniors are able to earn college credit for college-quality courses offered in our high school and paid for, in part, by the HOPE Program in Georgia. Fascinating speech from visionary Steve Jobs. Another reason to make YouTube available. Richard Bryne from Free Tech for Teachers shares about the new YouTube channel that will cover the US presidential election. Bookmark and share, especially if you have a current events class. "Mrs. Vicki, stay at the front of the class, I love to watch you laugh." "Yes, we love it when you laugh." Then, as I started it and began to move to the back of the class, that was when they begged me to stay at the front. I did. It struck me that I do laugh - quite a bit - but that my students "love it" when I laugh. They love it when they laugh. Your students love it when you laugh. Laughter and learning are good friends. While usually we're working hard, it is the laughter that makes the classroom and learning fun. I know an amazing Calculus teacher with a 100% pass rate on the AP exam- they laugh in her class. Her students write a hilarious song that they perform each year at the Christmas assembly. They make fun of how hard they study in Calculus and of her lovely bangs (which often stick up.) She laughs and they laugh - but they learn a lot. I think that many great teachers have an undercurrent of laughter - it makes the hard work more palatable. Like sugar in your coffee, laughter makes the strong brew of learning more palatable. Over 54,000 Common Core aligned middle school lesson plans shared for free over at share my lesson. Whether you use Common core or not, you might want to head over and share (or find) lessons for that emergency or when you want new ideas. I am still using Dropbox and love it as part of my "paperless as possible" classroom. With graphics like this, social media has officially hit the mainstream education circuit. Schools are finding that connected teachers are becoming revilatized and reenergized. Look at this poster and think about how it compares to your district's professional development. Even better, email it to someone you know and watch the conversations begin. Rejection sparks creativity in independent people because it validates their own thinking that they are different? That is what this research says. Rejection is "a form of validation." Well, it is one I'd rather not have to live so often, even if, perhaps, it makes me more creative. I hope this isn't used as an excuse to be unkind to those of us who are different - it already hurts enough - as I have been living this just today. It hurts - no matter the long term impact on my creativity, sometimes it is nice to be around kind people who like you. Twitter has recently cut of access to Tumblr and Instagram from letting people automatically connect to their friends on Twitter. This article about that and the relationshipts Twitter is crafting with organizations like NBC show that Twitter wants to be here for the long haul and wants to be in control. I find it interesting that Nbc cut off their relationship with Microsoft (the MSNBC channel is a casualty) but this move shows just how serious people are about the place Twitter has in the social media landscape. I find it ironic how many of my students are now moving to Twitter from Facebook because "my parents are on Facebook." Some are already latching onto Tumblr - another very powerful network. If you like to keep up with social media, I'd read this article. Joe Bower reposts an Alfie Kohn post about the time on task and whether it really means kids are learning. Great read. "Let’s look at the research a little more closely. The amount of time a student spends on a task “is not so consistently related to achievement as it may seem,” one scholar concluded from her review of several studies on the subject. “Time is a necessary, but not sufficient, condition for learning. Learning takes time, but providing time does not in itself ensure that learning will take place. More time may result in more learning – if [lack of] adequate time was the major cause of the problem in the first place. If other factors were the real cause, then providing more time will not be an effective strategy.”"
A free plagiarism tracker that is free. Students and teachers can use this site and have exposure to this sort of service even if they can't afford a pay-for service. The world needs your unique talents and insights for engaging students in work that matters. Understanding and acting on this truth, as championed by Angela Maiers, can change the world. Greg Witkin’s students create media presentations which serve as vehicles of social change. Julie Hembree’s 4th grade students created book trailers regarding favorite books to persuade their peers which books to read. Peers accessed their videos via SchoolTube and QR codes affixed to books in the School Library. Many innovative teachers, observed Alan November at #PILUS, prefer to focus on innovation rather than on promoting innovative instructional practices. Innovative teachers, let’s break this stereotype! You have unique talents and insights for engaging students in work that matters. Some teachers almost instinctively identify the big ideas and important skills of their curriculum and design projects that allow students to master these concepts and skills. Other teachers brilliantly support students’ leveraging of technology to connect with a global audience for the students’ work. Still other teachers wow us with their ability to coach students’ collaboration with peers and adults. As Angela Maiers emphasizes, claim your genius by acknowledging your genius. The system, comprised of schools, school districts, state governments, federal governments, and other entities, needs vast improvements in terms of opportunities for teachers to share their genius. Even as I work to improve these opportunities within my district, I encourage you not to wait for the system to improve its capacity for genius sharing. Take advantage of the opportunities that already exist to share your genius. Share your genius within your school and encourage your colleagues to do the same. Share at a department meeting, grade level team meeting, or faculty meeting. Share examples of student work. Tell the story of your design of the learning in your class. Provide rubrics and other resources. Share your genius outside your school. Present at a conference. Employ digital tools to amplify your impact. Tell your story via Twitter, a blog, or YouTube. If you have not actively used any of these tools, stick your toe in the social media water by learning just one tool. Use whatever opportunities exist. You may not have opportunities to attend conferences or to formally present within your school or district. Perhaps you are hesitant to wade into the social media pool. Recognize that while the twittersphere and blogosphere are social spaces where people interact, the hallways, teacher lounges, and classrooms of our schools are also social spaces. Raise awareness of innovation by sharing student work with a colleague and sincerely soliciting advice regarding improving the student work. Carve out new spaces for you and your colleagues to share their expertise with one another. Recruit other teacher-leaders in your school or district to organize sharing opportunities to supplement or replace presenters from outside your district. Connect with other teacher-leaders via #DotDay and #Choose2Matter. 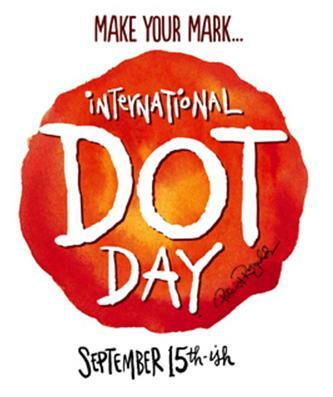 Tens of thousands of educators participate each year in International Dot Day, which is inspired by the award-winning children’s book The Dot, written by Peter Reynolds. In The Dot, a teacher inspires her student to leave her mark on the world. This year, as a follow-up to Dot Day, teachers and students will connect their dots by collaborating to do work that makes a difference locally, nationally, and globally. Choose2Matter, a hashtag created by Angela Maiers, reflects the notion of using one’s genius to change the world. The world needs your genius so Choose2Matter. Others will benefit from your genius and you will be enriched by the connections as well! 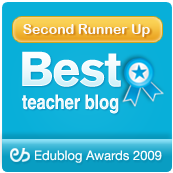 If you share the most quality lessons on the Share my lesson website, you can win an ipad. This is a set of 12 lessons about what it was like for children to live in the second world war. I love this set of lessons because it builds empathy and helps teach the story of world war 2 from a child's perspective. The first handout on this page is a good overview of the timeline of 9/11. September 11 is coming up. While it is still very hard for many of us to even talk about this day, we have a whole 11+ years of our students who have no memory of this event. As teachers, we must get ourselves together to discuss and teach this event. As I've been reviewing the content on the share my lesson website, I've found a piece that I may consider in my own classroom, the world trade center film review piece. It has several films including "Saving Private Ryan" but also the film "World Trade Center" which would make for a good piece to use in the classroom. Since I've recently given a set of my curated plans for math teachers, English teachers and general common core standards (see end of this post), I thought I'd share some lessons for history teachers. If you're a history teacher and not following #sschat on Twitter, you should. June 28 is the anniversary of the outbreak of World War 1. As you discuss this topic, here are some activitiesa and lessons to help you. There are some "causes" activities to introduce World War 1 that may interest some social studies teachers. The woodmen of the world had a "if I were president" competition sometime back, but I think since this is an election year, it is time to bring back some sort of competition like this to our students. You can see the recording of this student's speech on this news media page.This might be a great activity for the fall or even as a summer assignment to begin researching and writing speeches. If you want to teach about the Olympics, the TES forum out of the UK is where the great content is being uploaded daily. There are two activities of note, one is Olympic Games: Now and then and another is about Greek Ideas and what has been passed down. Many interesting lessons by grade level. I have to bookmark this site just for me. This Steampunk emporium has such great period clothing (had to buy some for a project for my child) that I just had to bookmark and share it. It took a good 30 minutes of searching before I found it. Great costumes and cool things to use if you're talking pioneer or early 1900's. This is a lesson plan for younger students (grades 1-4) for discussing World War 2. There are lesson plans here. One is "how has life in britain changed since 1948" which could be used for any age in the US because often our documents focus on a US centric view. The other is "what was it like for children in world War 2" which is a fascinating way to approach this with any children. Using the Simpson's teach about bias and history in this middle school activity that includes interactive whiteboard resources, movies, and a handout. A website that lets you find and create timelines. Powerful tool for history teachers. This pitch for the project Perspective Detectives by Cynthia Sandler, one of our current class of Flat Classroom certified teachers completely left me awe struck and excited. Wow! What do you think? What a history project! Dare we do such a thing? 100 years in 10 minutes. Yes. It is on YouTube. This video is going viral. If you had to compile your last 20 years in 2 minutes or your 80 year life span in 8 - what would make it? This is one to watch and share. It is a bit upsetting as you see the war and devastation but I have to wonder if those are the things we remember. In the UK, Holocaust Memorial Day is the 27th of January. This is something that we should all discuss and cover in an age appropriate way. Actually, I have permission and show Hotel Rwanda to my class. I want the students to understand and know what happens in the world and that all it takes for bad things to happen is for good people to do nothing. Dyslexic friendly resources for teaching about the Holocaust.Notes and handouts. Talk about the McCarthy trials using archived film from the 1950's. Lesson plans about the vietnam war. This is a UK document and may give you different perspectives in your studies. Worksheets, powerpoints, and documents to use with this 3 lesson. It includes a lesson on military tactics. This is a lesson plan that you can use as a starting point if you choose to involve your classrooms in the movement to end slavery in the world. Could you imagine if we could leave a legacy of this one thing. Our job is to speak for the helpless and to encourage empathy and understanding for others in this generation of children. It isn't all about what you can get, but about what you can give. This booklet is out of the UK. "The antislavery movement was the first major campaign in Britain to involve ordinary citizens across all classes (as well as the slaves themselves) in the struggle to end the practice. As such it is a good example of how change can come about when people work together for a just cause. This booklet More…intends inspire and equip young people to take a stand against the continuation of slavery and injustice in the world today." This is an excellent set of world war 2 resources from the UK including videos and lesson plans. For elementary school. I have a blog post about this going up on Sunday, but this Virginia Tech professor, John Boyer, used a youtube video to request a skype meeting with Burmese democracy leader Aung San Suu Kyi and on Monday they will be skyping at 7pm EAstern. Wow. Dr. James Beeghley (Jim as most of us know him) has a presentation on Wednesday at K12 online about how history and social studies should be taught using technology. He talks about early photography and a lot of other very cool thoughts that will certainly challenge the thinking and teaching of history teachers. Discussions of propaganda are great ones to have. Here you can see quite an assortment of World War 2 propaganda. Right now in the UK they are observing remembrance day so a lot of resources are being shared that we can use on this topic. It would be interesting to have students look for modern day propaganda? How about looking at US elections - do we have propaganda there? Just discussing that topic would be interesting. Taxation without representation lesson from history teacher Christina Lambard had parents calling the school to complain. A letter was sent home that said kids would be charged 25 cents a page and if unpaid they would get a zero. Usually the kids figure out the note is false. This year parents started calling the school before talking to the teacher. This lesson has been taught before without the hubbub . I think a bigger point here is that parents should learn to call the teacher first. EAch week the news of the week is posted in rap style format in a classroom-friendly format to this website. For government or current events - maybe this will help. Veterans History Project Home page -- GREAT PROJECT!!!! For history teachers and others - a new online history museum for those who love history and want to share it. 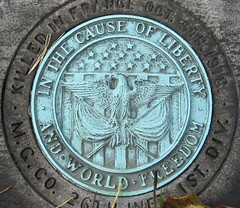 Fascinating link for social studies and some samples. I LOVE how some web pages were inserted using bitty browser. What a cool tool. This site also features several dipity timelines. This is a GREAT site for history teachers to see. Government organizations like the smithsonian are reaching out to educators and others with an online presence. This cool site has lesson plans and lots of great information for arts, science and technology, history and culture, and language arts. Learn how to use Google maps and research to explore any point in history. This is a great lesson for history teachers from Cheryl Davis. Once you go flat, you never go back!